Patrick Brian "Pat" Burrell (born October 10, 1976), nicknamed "Pat the Bat," is a former American professional baseball outfielder who played in Major League Baseball. He stands 6 feet 4 inches (1.93 m) tall and weighs 235 pounds (107 kg). He batted and threw right-handed. He played with the Philadelphia Phillies, the Tampa Bay Rays, and the San Francisco Giants. Burrell attended the University of Miami, where he won the Golden Spikes Award in 1998. In 1998, he was the first overall draft pick by the Phillies. After two years in the minors, Burrell was called up by the Phillies in 2000, and he finished fourth in voting for the National League Rookie of the Year Award. After hitting 27 home runs in 2001 (the first of eight straight years in which he would hit at least 20), he hit a career-high 37 home runs in 2002 and finished 14th in NL Most Valuable Player Award voting. In 2003, he signed a six-year contract with the Phillies but batted a career-low .209 with 21 home runs. In 2004, he batted .257 with 24 home runs but missed several games with a wrist injury. He hit 32 home runs in 2005 and finished seventh in NL MVP Award voting after he set a career high with 117 RBI. In 2006, he batted .258 with 29 home runs and 95 RBI but was benched for a few games due to a slump after April. He batted .256 with 30 home runs in 2007 as the Phillies reached the playoffs for the first time in his career. Burrell hit a home run in the playoffs as the Phillies were swept in the first round. In 2008, he hit 33 home runs as the Phillies reached the playoffs again, winning the World Series. After the 2008 season, Burrell became a free agent. He signed a two-year deal with the Tampa Bay Rays to be their designated hitter, and he batted .221 with 14 home runs in 2009. After he batted .202 with two home runs in his first 24 games of the 2010 season, he was designated for assignment by the Rays. He became a free agent and signed with the San Francisco Giants several days later. He took over as the Giants' left fielder and hit 18 home runs in 96 games for the Giants as they made the playoffs. Burrell did not have a hit in the World Series, striking out eleven times in fifteen plate appearances, but he got his second World Series ring as the Giants won it. Following the year, he signed a one-year deal to return to the Giants in 2011. He lost his left field job in 2011, and he batted .230 with a career-low 7 home runs in 92 games in addition to suffering a career-ending foot injury. He filed for free agency on October 30, 2011 and later signed a 1-day contract in 2012 to finish his career with the Phillies. On May 19, 2012 against the Red Sox, Burrell threw out the ceremonial first pitch and subsequently retired. He is currently a special assignment scout for the Giants and an assistant to general manager Brian Sabean. Burrell attended San Lorenzo Valley High School in Felton, California, as a freshman. After his freshman year, he transferred to Bellarmine College Preparatory in San Jose, where he played baseball and football. In the football program, playing quarterback, Burrell competed against Tom Brady, who played for rival Junipero Serra High School in San Mateo, California. He decided to concentrate on baseball in his senior year, however, and he was named the California Coaches Association Player of the Year after he batted .369 with 11 home runs. After graduating from high school in 1995, Burrell was drafted by the Boston Red Sox in the 43rd round of the 1995 Major League Baseball (MLB) Draft. Instead of signing, he chose to attend the University of Miami, where he played third base and was a teammate of Aubrey Huff. As a freshman, he was selected as a First-Team All-American by Baseball America and the Collegiate Baseball Newspaper. He was also named the Most Outstanding Player of the 1996 College World Series, joining Dave Winfield and Phil Nevin as the only players to win the award without winning the series. In his sophomore year, he was again named a First-Team All-American by Baseball America and the Collegiate Baseball Newspaper but also by the Sporting News this year. He was named Baseball America's Summer Player of the year in 1997. In 1998, as a junior, he won the Golden Spikes Award as the best player in college baseball. That year, he was drafted by the Philadelphia Phillies with the first overall pick in the 1998 MLB Draft. Burrell finished his college career with 61 home runs, 187 runs batted in (RBI), and 170 walks in 162 games. His .442 batting average was seventh all-time by an NCAA player, and his slugging percentage of .888 was second only to Pete Incaviglia. In February 2008, Burrell was inducted into the University of Miami Sports Hall of Fame. On July 24, Burrell and the Phillies agreed to a five-year contract with a $3.15 million signing bonus. Upon signing, Burrell was assigned to the single-A advanced Clearwater Phillies of the Florida State League, and he was moved to first base because Scott Rolen, Philadelphia's third baseman in the major leagues, had just won the National League (NL) Rookie of the Year Award. With Clearwater in 1998, Burrell batted .303 with 7 home runs and 30 RBI in 37 games. ^ a b c d "Pat Burrell Statistics and History". ^ Hagen, Paul (April 12, 2012). "Burrell grateful for chance to retire with Phillies". ^ Seimas, Jim (October 7, 2010). "Giants slugger Pat Burrell, a Boulder Creek native, makes most of second chance". ^ a b Schlegel, John and Tom Singer (February 6, 2011). "After Super Sunday, turn to Spring Training". ^ a b c "CNN/SI-Baseball Draft-Phil's make Burrell top pick of draft". ^ "Plus: Baseball; Miami's Burrell Wins College Award". ^ "Pat Burrell". University of Miami Sports Hall of Fame. Retrieved August 12, 2012. ^ "National League: Roundup; Never Say Die: Philadelphia Comes Back and Takes Two". ^ a b c d e f g h i "Pat Burrell Minor League Statistics & History". ^ a b Kimmey, Will (December 28, 2004). "Baseball America – Top 10 Prospects: Philadelphia Phillies". ^ a b "Pat Burrell 2000 Batting Gamelogs". ^ "Kevin Jordan 2000 Batting Gamelogs". ^ a b "Rico Brogna 2000 Batting Gamelogs". ^ "May 24, 2000 Philadelphia Phillies at Houston Astros". ^ "May 25, 2000 Philadelphia Phillies at Houston Astros". ^ Popper, Steve (June 21, 2000). "Baseball; Benitez Is Given the Ball, and Drops It". ^ Kepner, Tyler (June 22, 2000). "Baseball; Burrell, a Rookie, Uses Power to Help Phillies Win Again". ^ "July 2, 2000 Pittsburgh Pirates at Philadelphia Phillies". ^ "August 8, 2000 San Diego Padres at Philadelphia Phillies". ^ Chass, Murray (July 27, 2000). "Baseball; Schilling to Arizona As the Mets Just Shrug". ^ "Travis Lee 2000 Batting Gamelogs". ^ Popper, Steve (September 22, 2000). "Baseball; Mets Receive No Favors From Phillies". ^ "Baseball: Roundup; Braves' Furcal Named Top Rookie". ^ "National League: Roundup; Daal and the Phillies Control Atlanta's Bats". ^ "National League: Roundup; Bonds Becomes 17th To Hit 500 Home Runs". ^ Kepner, Tyler (May 29, 2001). "Baseball; Benitez Opens Door, and Phillies Sashay Through". ^ "May 29, 2001 Philadelphia Phillies at New York Mets". ^ "July 4, 2001 Philadelphia Phillies at Atlanta Braves". ^ Hermoso, Rafael (July 21, 2001). "Baseball; A Frightful Friday for Mets and Yankees". ^ "Pat Burrell 2001 Batting Gamelogs". ^ "August 10, 2001 Los Angeles Dodgers at Philadelphia Phillies". ^ "National League: Roundup; Reynolds Wins 100th as Astros Win Central". ^ a b "Philadelphia Phillies Top 10 Batting Leaders". ^ Mandel, Ken (April 7, 2002). "Burrell gives Phillies a lift". ^ "April 10, 2002 Atlanta Braves at Philadelphia Phillies". ^ Mandel, Ken (June 2, 2002). "Person pops a pair of homers". ^ Trzcienski, J. S. (July 15, 2002). "Phils rally to crush Expos". ^ Gurnick, Ken (August 10, 2002). "Dodgers win with clutch home run". ^ Mandel, Ken (August 30, 2002). "Win puts Phillies a game over .500". ^ Straziuso, Jason (February 3, 2003). "Burrell Agrees to $50M Deal With Phillies". ^ "April 9, 2003 Atlanta Braves at Philadelphia Phillies". ^ "May 20, 2003 Philadelphia Phillies at New York Mets". ^ Mandel, Ken (August 9, 2003). "Burrell belts pair to seal comeback". ^ a b Mandel, Ken (August 22, 2003). "Thome and Burrell lead Phils to win". ^ "September 28, 2003 Atlanta Braves at Philadelphia Phillies". ^ "Ricky Ledee 2003 Batting Gamelogs". ^ "Jim Thome Stats, Bio, Photos, Highlights". ^ Mandel, Ken (April 27, 2004). "Burrell boosts Phils over Cards". ^ Mandel, Ken (May 2, 2004). "Phillies rally to top D-Backs in 14". ^ "May 14, 2004 Philadelphia Phillies at Colorado Rockies". ^ Santoliquito, Joe (May 18, 2004). "Burrell leads home run barrage". ^ Mandel, Ken (July 30, 2004). "Pair's pair can't save Phillies". ^ Burgin, Sandy (August 5, 2004). "Notes: Outfield in Utley's future?". ^ Mandel, Ken (August 16, 2004). "Burrell will attempt to hit". ^ Mandel, Ken (September 3, 2004). "Notes: Burrell thrilled to be back". ^ Mandel, Ken (April 9, 2005). "Floyd, Phillies topple Cards". ^ Mandel, Ken (April 11, 2005). "Burrell earns NL Player of Week honors". ^ "May 12, 2005 Cincinnati Reds at Philadelphia Phillies". ^ Mandel, Ken (May 22, 2005). "Phils ride power, pitching to win". ^ Mandel, Ken (May 23, 2005). "Burrell NL's Player of Week again". ^ Mandel, Ken (June 5, 2005). "Overturned call helps Phils stay hot". ^ Mandel, Ken (June 11, 2005). "Phillies stay hot at home". ^ Mandel, Ken (July 14, 2005). "Phillies hit five homers in rout". ^ Perkins, Owen (July 31, 2005). "Phils grab big lead, hold off Rockies". ^ Mandel, Ken (August 10, 2005). "Burrell, Phils rally late to sink Dodgers". ^ Mandel, Ken (August 13, 2005). "Burrell muscles win out of vast PETCO". ^ Mandel, Ken (September 10, 2005). "Phillies crush Marlins to snap skid". ^ Mandel, Ken (September 11, 2005). "Big third inning plenty for Phils in finale". ^ "2005 National League Batting Leaders". ^ "2005 Regular Season MLB Baseball LF Fielding Statistics". ^ Mandel, Ken (September 28, 2005). "Notes: Burrell, Utley club MVPs". ^ a b "Pat Burrell 2006 Batting Gamelogs". ^ "David Dellucci 2006 Batting Gamelogs". ^ Nobles, Charlie (May 1, 2006). "Phils storm back late, upend Marlins". ^ Mandel, Ken (May 8, 2006). "Phillies run winning streak to eight". ^ Mandel, Ken (June 10, 2006). "Phils rally, but lose to Nationals". ^ Walsh, Michael (June 10, 2006). "Burrell's blast boosts Phils in D.C.". ^ Mandel, Ken (June 15, 2006). "Phils frustrated over sweep by Mets". ^ Mandel, Ken (July 15, 2006). "Howard, Burrell lead Phillies' attack". ^ Crawford, Ryan (August 23, 2006). "Moyer's Phillies debut a success". ^ Yanik, Kevin (September 16, 2006). "Burrell's slam lifts Myers, Phillies". ^ "September 20, 2006 Chicago Cubs at Philadelphia Phillies". ^ Mandel, Ken (September 30, 2006). "Phils roll, but remain two games back". ^ "2000 Philadelphia Phillies Batting, Pitching, and Fielding Statistics". ^ a b c d "Pat Burrell 2007 Batting Gamelogs". ^ Nobles, Charlie (April 6, 2007). "Phillies rout Marlins behind Moyer". ^ "Greg Dobbs 2007 Batting Gamelogs". ^ "Jayson Werth 2007 Batting Gamelogs". ^ "Michael Bourn 2007 Batting Gamelogs". ^ Mandel, Ken (May 11, 2007). "Phillies cruise past Cubs in opener". ^ Fastenau, Stephen (July 14, 2007). "Phillies homer past Cards". ^ Mandel, Ken (July 18, 2007). "Offense erupts as Phils drub Dodgers". ^ Von Benko, George (August 18, 2007). "Phils use 16-hit attack to rip Bucs". ^ Mandel, Ken (August 28, 2007). "Utley homers in return, Phils drill Mets". ^ "August 29, 2007 New York Mets at Philadelphia Phillies". ^ Mandel, Ken (August 30, 2007). "Phils win wild one to finish sweep". ^ Mandel, Ken (September 22, 2007). "Phillies go to their bread and butter". ^ a b Mandel, Ken (August 23, 2008). "Burrell drives in five as Phillies roll". ^ "2007 Regular Season MLB Baseball LF Fielding Statistics". ^ "Yearly League Leaders & Records for Errors Committed as OF". ^ Jasner, Andy (October 1, 2007). "Phils fans turn out for Rally Monday". ^ Mandel, Ken (October 1, 2007). "Playoff payoff a sweet one for Burrell". ^ "October 3, 2007 National League Division Series (NLDS) Game 1, Rockies at Phillies". ^ a b "Pat Burrell Postseason Batting Gamelogs". ^ a b c "Pat Burrell 2008 Batting Gamelogs". ^ Wallner, Jeff (April 7, 2008). "Phillies sack Reds with four homers". ^ Mandel, Ken (April 24, 2008). "Burrell comes through for Phils". ^ Mandel, Ken (May 3, 2008). "Phils win thriller on Burrell blast in 10th". ^ Carley, Jim (May 23, 2008). "Burrell comes through in a pinch". ^ Mandel, Ken (June 4, 2008). "Burrell powers Phils to third straight win". ^ Mandel, Ken (July 13, 2008). "Burrell's homer keeps Phils atop East". ^ Mandel, Ken (August 16, 2008). "Moyer has upper hand in duel of vets". ^ Botello, Elizabeth M. (August 18, 2008). "Hamels halts drought, handcuffs Padres". ^ Mandel, Ken (October 5, 2008). "Phils advance to first NLCS since '93". ^ Mandel, Ken (October 10, 2008). "Homers send Phils to Game 1 victory". ^ Mandel, Ken (October 30, 2008). "Octoberphest! Phillies win World Series". ^ Mandel, Ken (October 31, 2008). "Phillies 'amazed' by scene at parade". ^ Mandel, Ken (November 6, 2008). "Moyer and Burrell file for free agency". ^ Gonzalez, Alden (December 16, 2008). "Ibanez excited to join world champs". ^ Chastain, Bill (January 5, 2009). "Rays land power bat in Burrell". ^ Jasner, Andy (April 4, 2009). "Burrell reflects on time with Phillies". ^ Chastain, Bill (April 9, 2009). "Burrell receives World Series ring". ^ Chastain, Bill (May 17, 2009). "Burrell on DL; Rays add Isringhausen". ^ Schonbrun, Zach (June 11, 2009). "Rays activate Burrell from disabled list". ^ Schonbrun, Zach (June 25, 2009). "Sweet revenge: Garza, Burrell sting Phils". ^ Schonbrun, Zach (July 7, 2009). "Walk-off win shows Rays solutions". ^ Chastain, Bill (September 3, 2009). "Burrell, Longoria rally Rays past Sox". ^ Chastain, Bill (September 15, 2009). "Arms give away Rays' early lead in loss". ^ Chastain, Bill (April 17, 2010). "Burrell's blast wins suspended game". ^ Chastain, Bill (April 27, 2010). "Big innings propel Davis, Rays past A's". ^ "Rays designate Burrell for assignment". ^ Chastain, Bill (May 19, 2010). "Burrell clears waivers, becomes free agent". ^ Kruth, Cash (May 29, 2010). "Giants sign Burrell to Minor League deal". ^ Haft, Chris (June 4, 2010). "Burrell joins Giants; Bowker sent down". ^ "Pat Burrell 2010 Batting Gamelogs". ^ "Aubrey Huff 2010 Batting Gamelogs". ^ Kruth, Cash (July 31, 2010). "Burrell's big fly caps Giants' huge month". ^ Haft, Chris (August 7, 2010). "Giants need no hits to tie, beat Braves". ^ Kruth, Cash (August 10, 2010). "Burrell caps Giants' extra-innings victory". ^ Haft, Chris (August 12, 2010). "Burrell's blast lifts Giants past Cubs". ^ Bodley, Hal (August 18, 2010). "Bodley: No celebration this time for Burrell". ^ Haft, Chris (October 9, 2010). "Giants squander chance to take big series lead". ^ Haft, Chris (October 17, 2010). "Jacks by Giants give Philly unhappy Halladay". ^ Haft, Chris (November 2, 2010). "Giants win the Series! Giants win the Series!". ^ Gurnick, Ken (December 3, 2010). "Burrell grateful for chance to return to Giants". ^ a b "Pat Burrell 2011 Batting Gamelogs". ^ Haft, Chris (April 19, 2011). "Lincecum superb behind offensive outburst". ^ "Cody Ross 2011 Batting Gamelogs". ^ "Nate Schierholtz 2011 Batting Gamelogs". ^ Haft, Chris (May 5, 2011). "Banner night for Lincecum in Big Apple". ^ Haft, Chris (June 28, 2011). "Giants' bats break out in twin-bill opener". ^ Haft, Chris (July 8, 2011). "Zito improves to 3-0 since return with gem". ^ Haft, Chris (July 16, 2011). "Prospect Sanchez called up; Burrell to DL". ^ De Nicola, Christina (August 13, 2011). "Specialist gives Burrell same foot diagnosis". ^ Haft, Chris (August 31, 2011). "Burrell excited to rejoin Giants". ^ Haft, Chris and Adam Berry (September 27, 2011). "Burrell gets a start in potential final game". ^ Gelb, Matt (April 18, 2012). "Phillies Notes: 'Special deal' for Burrell". ^ Rubin, Adam (August 31, 2007). "Utley's hit off Wagner cuts Mets' lead to two games". ^ "Batting Events – Pat Burrell". ^ a b Hine, Chris (June 20, 2009). "Burrell, an Infamous Mets Killer, Returns to Applause With the Rays". ^ Leventhal, Josh, ed. (2015). ^ Mandel, Ken (February 19, 2008). "Burrell not ready to leave Philly". Burrell was previously married but has been divorced since 2009. As of 2015, he is a special assignment scout for the Giants, based in Scottsdale, Arizona. Burrell showed a penchant for hitting home runs against the New York Mets. In 2007, Burrell hit four home runs in a four-game series sweep against the Mets in late August. In total, he hit 42 home runs against the Mets through the 2011 season, his highest total against any team, which ranked fifth all-time in home runs hit against the franchise at the time of his departure from Philadelphia (he has since fallen to sixth, having been passed by Chipper Jones.) Batting .264 at the Phillies' home parks against a .228 mark at Shea Stadium, Burrell nonetheless enjoyed playing in New York, citing the atmosphere and memorable home runs against Mets pitchers, including two in back-to-back games against then-closer Armando Benítez. Burrell signed a one-day contract with the Philadelphia Phillies on May 19, 2012, so he could officially retire as a Phillie. It was announced on February 28, 2015 that Burrell will be inducted onto the Phillies Wall of Fame. He was subsequently inducted on Friday, July 31. He stated, "I always knew that the fans were behind me, even through the tough times. When David (Montgomery) called and told me I had been voted in by the fans, it was overwhelming." He was the 37th inductee to the Wall of Fame. On November 1, Burrell filed for free agency. A month later, on December 3, he signed a one-year, $1 million contract to return to the Giants in 2011. In his first 20 games of 2011, Burrell batted .270 with five home runs and eight RBI. On April 18, he hit a game-winning three-run home run in an 8–1 victory over Colorado. After batting .172 with one RBI over his next 12 games, he was replaced as the Giants' left fielder by Cody Ross, who was replaced as the Giants' right fielder by Schierholtz. On May 4, Burrell had a game-winning RBI single in a 2–0 victory over the Mets. In the first game of a doubleheader against the Cubs on June 28, Burrell had a home run and three RBI in a 13–7 victory. He had a game-winning RBI single on July 7 in a 2–1 victory over San Diego. On July 15, Burrell was placed on the disabled list with a potentially career-ending foot injury. He returned from the DL on August 31, but he was not able to start regularly upon returning. For the final game of the year (a 6–3 loss to Colorado on September 28), Burrell started in left field after asking Giants' manager Bruce Bochy to put him in the lineup since it was potentially his final game. He finished the year batting .230 with career-lows in games (92), at bats (183), hits (42), home runs (seven), and RBI (21). On October 30, he filed for free agency. In Game 2 of the NLDS against Atlanta on October 8, Burrell hit a three-run home run in a 5–4 loss. On October 16, in Game 1 of the NLCS against the Phillies, he had an RBI double against Roy Halladay. Nate Schierholtz then pinch-ran for him, scoring the winning run in the Giants' 4–3 victory. 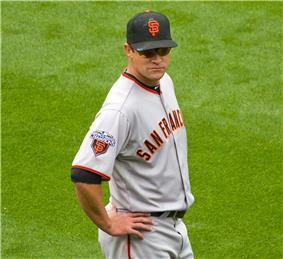 In the World Series, Burrell struck out eleven times in thirteen at-bats, had no hits, and was benched for Game 4. However, the Giants won the World Series in five games, and Burrell received his second championship ring. On May 29, 2010, the San Francisco Giants signed Burrell to a minor league contract and assigned him to the triple-A Fresno Grizzlies of the Pacific Coast League. After batting .313 with one home run and six RBI in five games, he was called up to the Giants on June 4 to replace John Bowker, who was optioned to Fresno. The next day, he took over from Aubrey Huff (who moved over to right field) as the Giants' left fielder. On July 31, with the Giants trailing 1–0 to the Dodgers in the eighth inning, Burrell hit a two-run home run to give the Giants a 2–1 victory. On August 6, he hit a game-winning sacrifice fly in the 11th inning of a 3–2 victory over Atlanta. Three days later, the Giants faced the Chicago Cubs for a four-game series. In the first game of the series, Burrell hit a walk-off sacrifice fly in the 11th inning of a 4–3 victory. In the third game, he had three RBI (including a game-winning home run in the eighth inning against Justin Berg) in a 5–4 victory. In the finale, Burrell hit two home runs (including a grand slam) and had five RBI in an 8–7 victory. On August 17, Burrell returned to Philadelphia for his first regular season game there as a member of the opposing team, and he received a standing ovation. He hit a home run in his first at bat of the game, but the Giants lost, 9–3. With the Giants in 2010, Burrell batted .266 with 289 at-bats, 18 home runs, and 51 RBI in 96 games as the Giants won the NL West and advanced to the playoffs for the first time since 2003. Burrell's 2010 totals were 373 at-bats, 94 hits, 20 home runs, and 64 RBI in 120 games. Burrell hit a game-winning two-run home run in the 12th inning of a 3–1 victory over Boston on April 17, 2010. On April 27, he hit a game-winning three-run home run in an 8–6 victory over the Oakland Athletics. In his first 24 games of the season, Burrell batted .202 with two home runs and 13 RBI. On May 15, he was designated for assignment and replaced on the Rays' roster by Hank Blalock. Four days later, he became a free agent after clearing waivers. On January 5, 2009, the Tampa Bay Rays signed Burrell to a two-year, $16 million contract. They planned to use him as their designated hitter. Burrell got a standing ovation when he returned to Philadelphia for an exhibition series on April 3 and 4. On April 9, Burrell flew to Philadelphia to join the Phillies as they received their World Series rings in a pregame ceremony. After the ceremony, he flew back to Boston for the Rays' game against the Boston Red Sox. On May 17, Burrell was placed on the disabled list (retroactive to May 12) with a neck strain. He was activated from the DL on June 11. On June 24, he hit a game-winning two-run home run and had three RBI in a 7–1 victory over the Phillies. On July 7, he hit a walk-off two-run home run in the 11th inning of a 3–1 victory over the Toronto Blue Jays. On September 2, he had a game-winning RBI single in an 8–5 victory over Boston. He had four RBI against Jason Berken (including a three-run home run) on September 15 in a 10–5 loss to Baltimore. Burrell slumped throughout the 2009 season, and he finished the year batting .221 in 122 games. He set or tied career-lows in hits (91), home runs (14), RBI (64), and walks (57). Burrell filed for free agency on November 6. On December 16, the Phillies signed left fielder Raúl Ibañez to a three-year contract, ending Burrell's tenure in Philadelphia. Burrell's 104 double plays grounded into were the seventh-most in Phillies history, and his 1,273 strikeouts were second only to Schmidt. However, Burrell was fifth in walks (785), eighth in RBI (827), and fourth in home runs (251) as a Phillie. His eight straight seasons with at least 20 home runs were topped only by Schmidt. In Game 4 (the final game) of the NLDS against the Brewers, Burrell hit two home runs (a three-run game-winning home run against Jeff Suppan and a solo home run against Guillermo Mota) in a 6–2 victory that gave the Phillies their first playoff series victory since 1993. Four days later, in the first game of the NL Championship Series, he hit a game-winning solo home run in a 3–2 victory over the Dodgers. After going hitless in his first 14 at-bats in the World Series, Burrell doubled against J. P. Howell of the Tampa Bay Rays on October 29 in Game 5 (the final game of the series). Burrell was then replaced by pinch-runner Eric Bruntlett, who scored the game's winning run in the 4–3 victory as the Phillies won their first World Series since 1980. After the series, Burrell was chosen to lead the Phillies' World Series parade. Burrell batted .326 in April 2008, with 8 home runs and 24 RBI. He hit two home runs on April 7 (including the game-winner) against Bronson Arroyo in a 5–3 victory over Cincinnati. On April 24, his two-run double against David Riske provided the game-winning RBI in the Phillies' 3–1 victory over Milwaukee. With the double, Burrell got his 23rd and 24th RBI of the month, breaking Hayes' team record for most RBI in April (22). After batting .227 in May (with five home runs), Burrell batted .256 with six home runs in June. His walk-off two-run home run with two outs in the tenth inning gave the Phillies a 6–5 victory over San Francisco on May 2. On May 22, Burrell hit a game-winning pinch-hit home run in a 7–5 victory over Houston. On June 3, he hit a game-winning two-run home run in a 3–2 victory over Cincinnati. He followed up his performance in June by hitting .304 in July with seven home runs, but he slumped over the final two months, batting .191 with seven home runs. He hit a game-winning three-run home run on July 13 in a 6–3 victory over Arizona. On August 15, his home run helped the Phillies defeat the Padres 1–0. Two days later, he hit a game-winning home run in a 2–1 victory over the Padres. He had five RBI (including a game-winning three-run home run against Clayton Kershaw) in a 9–2 victory over the Dodgers on August 23. Burrell finished the season batting .250 with 33 home runs (tied for ninth in the NL), 86 RBI, and 102 walks (third in the NL) in 157 games, and the Phillies won the NL East for the second straight year. In 2007, the Phillies won the NL East and reached the playoffs for the first time since 1993 and the first time in Burrell's career. Burrell hit a home run against Jeff Francis in the first game of the NL Division Series (NLDS) but had only one other hit in the series as the Phillies were swept by the Colorado Rockies. 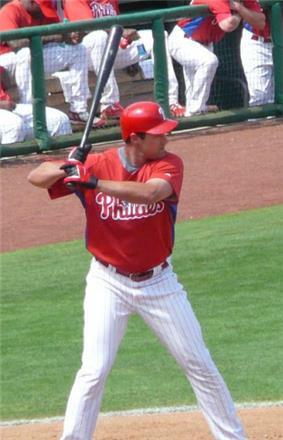 Burrell became the Phillies' longest tenured player in 2007 with the departure of Lieberthal via free agency. He hit only one home run in April but had a .292 batting average. On April 6, he homered and had four RBI (including the game-winner) in an 8–2 victory over Florida. He began to slump after April, batting .157 over the next two months. Once again, Manuel began benching him, using Greg Dobbs, Jayson Werth, or Michael Bourn in left field. On May 11, Burrell hit two home runs and had five RBI in a 7–2 victory over the Cubs. Werth was injured at the end of June, however, and Burrell reclaimed his starting job by batting .435 in July, with six home runs and 22 RBI. From July 1 through the end of the season, he batted .300 with 22 home runs and 65 RBI, starting the final 75 games of the season for the Phillies in left field. On July 14, he had four RBI in a 10–4 victory over St. Louis. Three days later, Burrell hit his 200th career home run in a 15–3 victory over the Dodgers. He had a 14-game hitting streak from July 22 to August 5, tying his career high. On August 17, in an 11–8 victory over the Pirates, Burrell got his 1,000th career hit, a two-run home run. At the end of August, the Phillies faced the Mets, whom they trailed in the NL East by six games, for a four-game series. In the first game of the series, on August 27, Burrell hit a game-winning two-run home run in a 9–2 victory. Two days later, in the third game of the series, he hit a solo home run and had a sacrifice fly (the game-winning RBI) against Óliver Pérez in a 3–2 victory. He hit two home runs in the fourth and final game of the series as the Phillies won 11–10 to sweep the Mets. On September 21, his two-run home run against Shawn Hill provided the game-winning RBI in a 6–3 victory over Washington. Burrell finished the 2007 regular season batting .256 with 30 home runs, 97 RBI, and 114 walks (a career high) in 155 games. Burrell, Ryan Howard, and Jimmy Rollins became the second trio of Phillies with 30 or more home runs (and the first since 1929). On defense, he led major league outfielders in errors, with 10, and his .948 fielding percentage was the lowest among left fielders. In April 2006, Burrell batted .300 with seven home runs. From April 14 to 27, he had 13 RBI in 11 games. However, he batted .249 for the rest of the season, and in June Philles' manager Charlie Manuel began benching him occasionally (often in favor of David Dellucci). On May 1, Burrell hit a game-winning solo home run in an 8–5 victory over Florida. On May 7, he had three RBI, including a two-run home run against Matt Morris as the Phillies defeated the Giants, 9–5. On June 9, he had three RBI, including a two-run home run against Gary Majewski, but the Phillies lost, 9–8, to the Washington Nationals. The next day, he hit a game-winning two-run home run in a 6–2 victory over the Nationals. On June 15, he hit two home runs and had three RBI against Steve Trachsel, but the Phillies lost to the Mets, 5–4. He had four hits and four RBI in a 14–6 victory over the Giants on July 15. On August 22, his RBI double in the sixth inning was the game-winning RBI in a 6–3 victory over the Cubs. His first inning grand slam against Roger Clemens on September 15 provided all of the Phillies' runs in a 4–3 victory over Houston. On September 20, his fielder's choice was the game-winning RBI in a 6–2 victory over the Cubs. He hit two home runs, had four RBI, and set a career high with four runs scored on September 29 in a 14–2 victory over Florida. In 144 games, Burrell finished the season batting .258 with 29 home runs and 95 RBI. Burrell finished the season batting .281 with 32 home runs in 154 games, and he set career highs in walks (99) and RBI (117). His 32 home runs led the Phillies, and his 117 RBI were second only to Andruw Jones' 128 (Pujols also had 117). On defense, however, he tied for the lead among all major league left fielders in errors, with seven, and the lowest fielding percentage among them, at .972. Burrell finished seventh in voting for the NL MVP award, and he was the co-winner of the Mike Schmidt MVP Award (along with Chase Utley). On April 9, 2005, Burrell had four hits and five RBI in a 10–4 victory over the Cardinals. He won the first NL Player of the Week Award of the 2005 season on April 10 after accumulating 15 RBI in the first week of the season. On May 12, he had four hits in a 7–5 loss to Cincinnati. He hit a three-run game-winning home run on May 22 in a 7–2 victory over the Baltimore Orioles. He won another Player of the Week Award that day after he batted .500 with two home runs and eight RBI during the week, becoming the first Phillies player to win the award twice in a season since Hayes won it twice in 1986. On June 5, his solo home run against Mike Koplove was the game-winner in a 7–6 victory over Arizona. Four days later, he hit two home runs and had four RBI in a 10–8 victory over the Texas Rangers. On June 11, he hit a game-winning three-run home run in a 7–5 victory over the Milwaukee Brewers. He hit two home runs and had five RBI in a 13–7 victory over Florida on July 14. On July 30, he had four hits and two RBI in an 8–7 victory over Colorado. On August 9, he had four RBI, including a go-ahead three-run home run against Steve Schmoll in an 8–4 victory over the Dodgers. His three-run home run against Jake Peavy on August 12 provided all of the Phillies' runs in a 3–2 victory over San Diego. He had four RBI on September 9 in a 12–5 victory over the Marlins. Two days later, he had four RBI again (including a three-run home run against Ismael Valdez) in an 11–1 victory over Florida. Burrell had four hits and three RBI on April 27, 2004, in a 7–3 victory over the Cardinals. He also made a leaping catch to take a home run away from Rolen, and he threw out Pujols trying to score from third base on a single by Edgar Rentería. On May 2, Burrell hit his first career pinch-hit home run: a two-run game-tying home run in the ninth inning against Matt Mantei of the Arizona Diamondbacks. The Phillies won the game, 6–5, in extra innings. On May 14, Burrell had four RBI (including the game-winner) in a 6–4 victory over the Colorado Rockies. He had four RBI again on May 18 (including two home runs) in an 8–7 victory over the Dodgers. On July 30, he hit two home runs in a 10–7 loss to the Cubs. On August 3, Burrell strained his left wrist during batting practice, and he was placed on the disabled list (DL) for the first time in his career the next day. He was originally scheduled to have season-ending surgery on August 13, but after getting a second opinion from Dr. Tom Graham, he decided to postpone the surgery and attempt to come back before the season ended. On September 3, he was activated from the disabled list. In 127 games, Burrell batted .257 with 24 home runs and 84 RBI. On February 3, 2003, Burrell signed a six-year, $50 million contract with the Phillies. He had two home runs and five RBI (including the game-winner) on April 9 in a 16–2 victory over the Braves. The home runs both came against Greg Maddux, making Burrell the sixth player to hit two home runs in a game against Maddux (and the first since Rolen did it in 2001). On May 20, he hit two home runs and had four RBI in an 11–7 victory over the Mets. On August 9, Burrell hit a game-tying solo home run and a game-winning two-run home run in the 8th and 10th innings of an 8–6 victory over the San Francisco Giants. He hit two home runs (including his 100th) on August 22 in a 9–4 victory over the St. Louis Cardinals. On September 28, he had the final hit in Veterans Stadium (a single against Jason Marquis) in a 5–2 loss to Atlanta. Burrell endured a season-long slump, and he was occasionally benched for a few games (often in favor of Ricky Ledée) by Phillies' manager Larry Bowa. In 146 games, he batted .209 with 21 home runs and 64 RBI. However, his 21 home runs were still the second-highest total on the Phillies (teammate Jim Thome led the NL with 47). Burrell hit a leadoff walk-off home run on April 7, 2002, in the 11th inning of a 3–2 victory over the Florida Marlins. Three days later, on April 10, Burrell hit a two-run walk-off home run in the 11th inning to give the Phillies a 7–5 victory over the Braves. He was the first player in the major leagues to hit two such home runs in a four-day period since Albert Belle did it in 1995, and he was the first Phillie to hit two such in a season since Von Hayes hit two in 1989. In May, he hit eight home runs, the most by a Phillie in May since teammate Mike Lieberthal hit eight in 1999. From June 2 through June 16, he had an 11-game hitting streak, his longest of the season. During the streak, on June 2, he tied a career-high with five RBI in an 18–3 victory over the Montreal Expos. Burrell had 22 home runs by the All-Star break, the most by a Phillie since Mike Schmidt had 31 by the 1979 All-Star break. On July 15, he hit a game-winning three-run home run against Matt Herges in an 11–8 victory over Montreal. He had two home runs, five RBI, and a grand slam in a 7–6 loss to the Dodgers on August 9. On August 30, Burrell had three RBI (including the game-winner) in a 7–5 victory over the Mets. He had his one hundredth RBI that day, becoming the first Phillie with 100 RBI by August 31 since Greg Luzinski did it in 1977. Burrell finished the season with career highs in almost every offensive category, including runs (96), batting average (.286), and games (157). He was the 12th Phillie with 30 home runs and 100 RBI in a season. His 37 home runs were seventh in the NL, and his 116 RBI were third, behind only Lance Berkman (128) and Albert Pujols (127). He was 14th in NL Most Valuable Player Award voting. On April 14, 2001, Burrell hit a game-winning home run in the sixth inning of a 2–1 victory over the Atlanta Braves. He had a game-winning two-RBI double in the ninth inning as the Phillies beat the Chicago Cubs, 6–3, on April 17. From May 19 to June 2, he had a career-high 14-game hitting streak. During the streak, on May 28, he hit a game-winning two-run home run against Benítez in the tenth inning of a 5–3 win over the Mets. He hit a home run and had four RBI the next day as the Phillies beat the Mets, 7–3. He hit a game-winning three-run home run on July 4 in a 4–1 victory over the Atlanta Braves. On July 20, he had a home run and five RBI (including the game-winner) as the Phillies beat the Mets, 10–1. He hit home runs in three straight games from July 31 to August 2. On August 10, as the Phillies beat the Los Angeles Dodgers, 10–5, he hit his third career grand slam. He had a home run and three RBI in the final game of the season in a 4–1 victory over the Cincinnati Reds. Burrell finished the season with 27 home runs, 70 RBI, and a .258 batting average in 155 games. His 18 assists led NL outfielders and tied with Raúl Mondesí for most in the major leagues. However, his 162 strikeouts were the third-highest total in Phillies' history at the time, and they currently are the ninth-highest total. On May 23, 2000, Burrell was called up by the Philadelphia Phillies. On May 24, he replaced Kevin Jordan (who had been filling in for injured Opening Day first baseman Rico Brogna) as the Phillies' first baseman. Making his major league debut that day, he had two hits (his first coming against Octavio Dotel) and two RBI in a 9–7 victory over the Houston Astros. The following day, he hit his first career home run in a 10–6 loss to Houston. 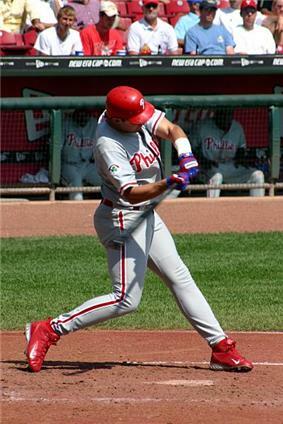 On June 20, with the Phillies trailing 2–1 against the New York Mets, he hit a home run against Mets' closer Armando Benítez to make the score 2–2 in an eventual 3–2 victory for Philadelphia. The next day, Burrell had five RBI, two home runs, and his first career grand slam in a 10–5 victory for Philadelphia. On July 2, he had four hits and two RBI in a 9–1 victory over the Pittsburgh Pirates. He remained the Phillies' first baseman when Brogna returned in July. He had five RBI, two home runs, and a grand slam on August 8 in a 10–4 victory over the San Diego Padres. On August 9, newly acquired outfielder Travis Lee was moved to first base, and Burrell was moved to left field for the rest of the year. On September 21, he had a game-winning walk-off single against Rick White in a 6–5 victory against the Mets. He finished the season with 18 home runs, 79 RBI, and a .260 batting average in 111 games, and he had the fourth most votes for the NL Rookie of the Year Award. Burrell was named the Phillies' top prospect and the second-best prospect in baseball by Baseball America in 2000. He began the season with Scranton/Wilkes-Barre. Playing first base and the outfield, he batted .294 with 4 home runs and 25 RBI in 40 games.